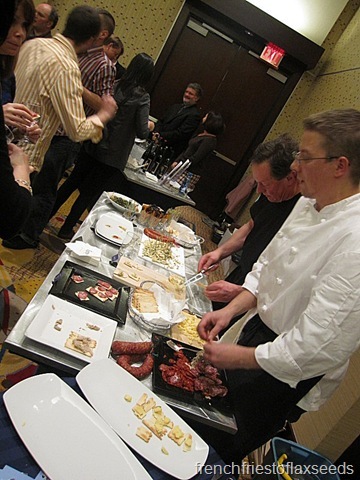 ‘Tis the season for food and drink events around Vancouver. From Dine Out Vancouver to Tales of the Cocktail (wish I could afford the $155 price tag for this one! 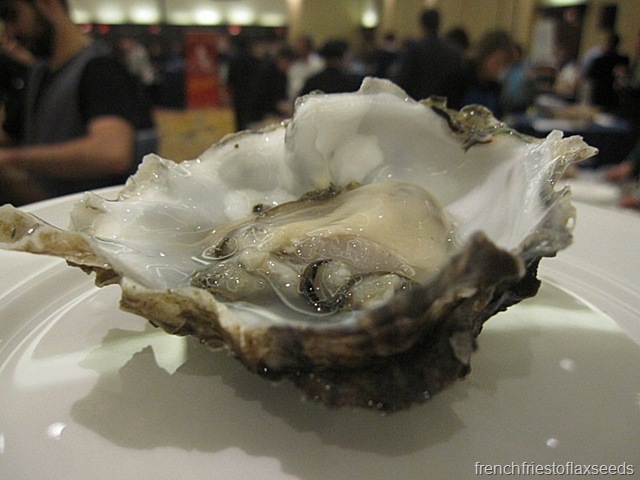 ), there is something to tickle every taste bud out there. Not all of them are in my price range, but when I found out I had won tickets to Taste BC 2011 from Follow Me Foodie, a wine tasting charity event for BC Children’s Hospital’s Oak Tree Clinic, I made sure I had the night off work to get dressed up and enjoy some of BC’s finest wines, spirits, and eats. 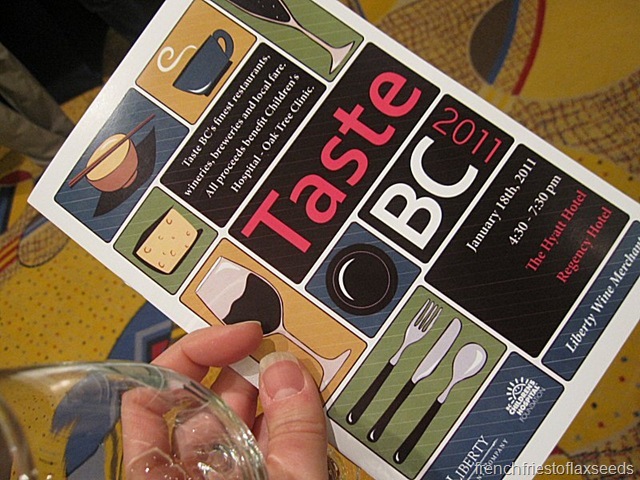 Taste BC 2011 was held at the Hyatt Regency Hotel in downtown Vancouver in the Regency Ballroom. Fun trivia fact – this was also the location of my Grade 12 Graduation dinner and dance way back in the day. Seemed only appropriate that my date for the evening was a fellow foodie I graduated high school with – Jill from Jill’s Test Kitchen. 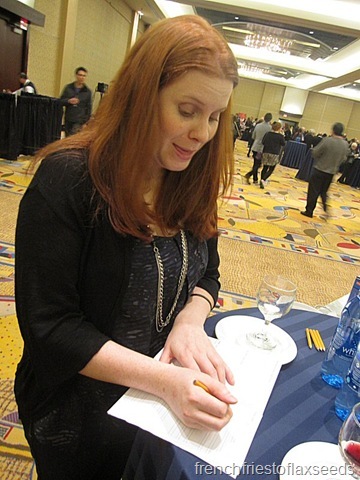 Jill elected herself scribe for the evening, marking down each of the wines we tasted. Which was a good idea, because there were 60+ wineries each sampling multiple wines, plus some local breweries and spirit distilleries. 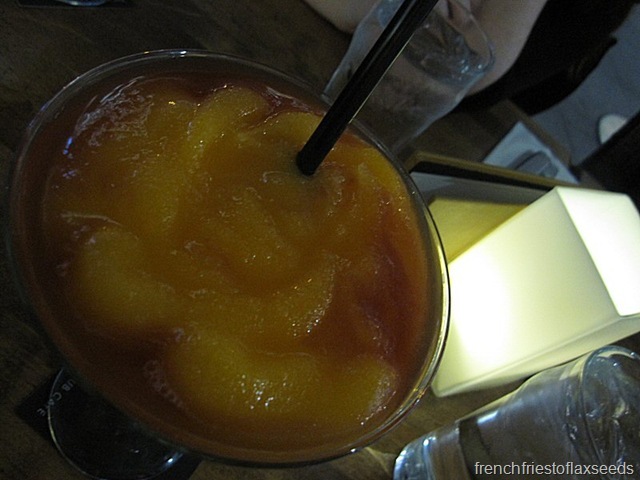 There’s no way we’d be able to keep all those sips straight by the end of the evening. We also decided to limit our tastings to one type of wine each – I would be in charge of reds while Jill would be in charge of whites. We skipped out on all of the beers, since neither of us are really beer fans. 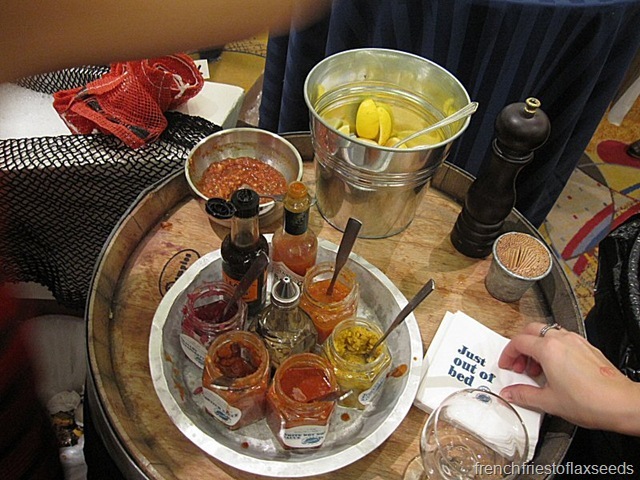 I wish I could say I had photos of everything I tasted and detailed notes on them. But that’s not how I roll. Not to mention the lighting was horrible, and it was really hard to carry around my purse, a plate, a wine glass and wield a camera while wearing heels and becoming increasingly tipsy. But I shall do my best to describe some of the highlights. 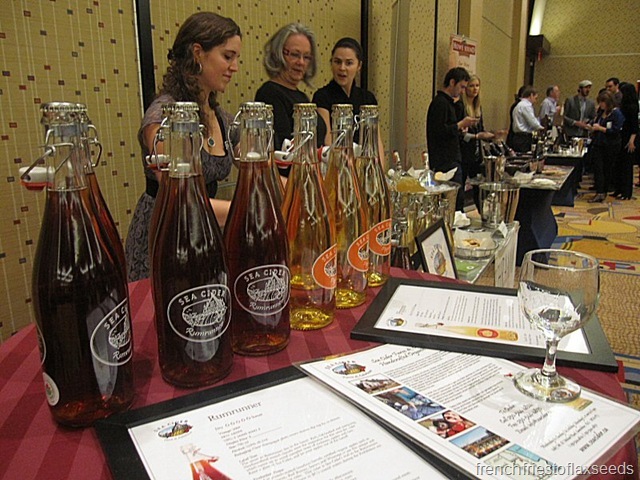 Sea Cider – a cidery on Vancouver Island just outside of Victoria. 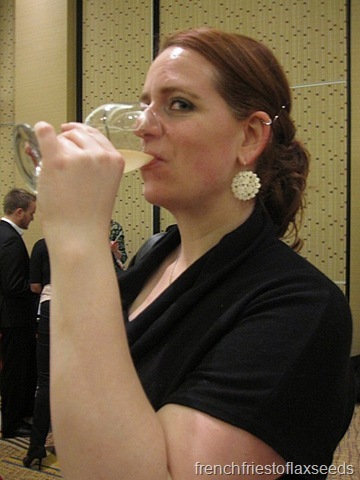 My sister and I visited for a tasting back in August 2009 (read about it here). Benton Brothers Fine Cheese – delicious local BC cheeses. 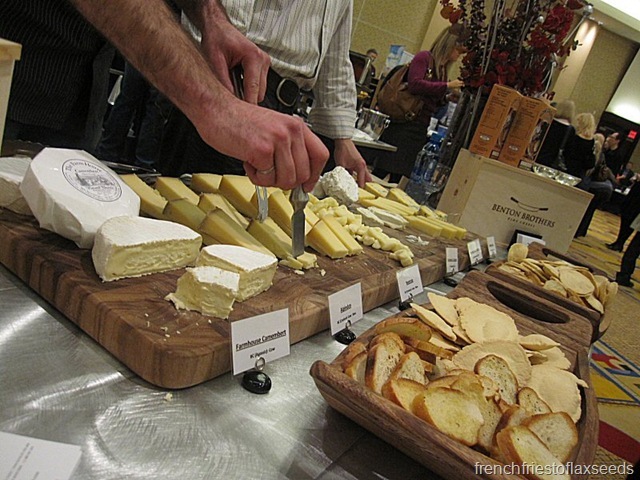 You can’t have a wine tasting without a little cheese, can you? 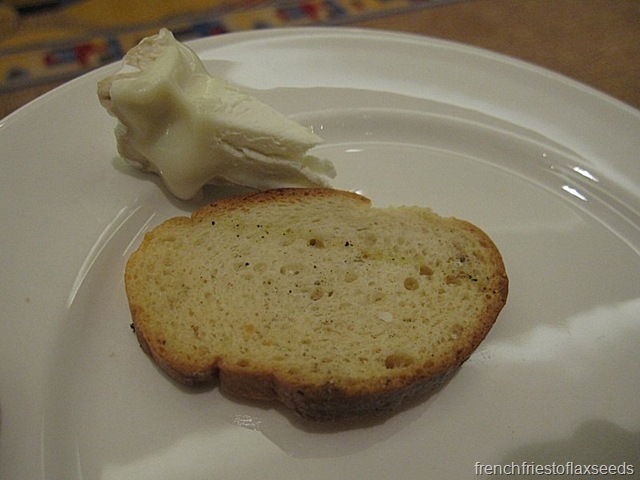 I enjoyed a goat brie that was creamy and amazing. 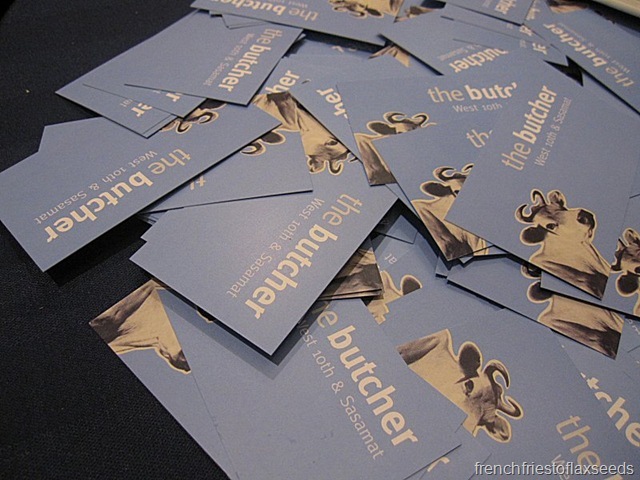 The Butcher – as the name implies, a location for locally sourced artisan and ethical meats. I pass by their store almost every day on my way to and from school, but of course, have never stopped in. 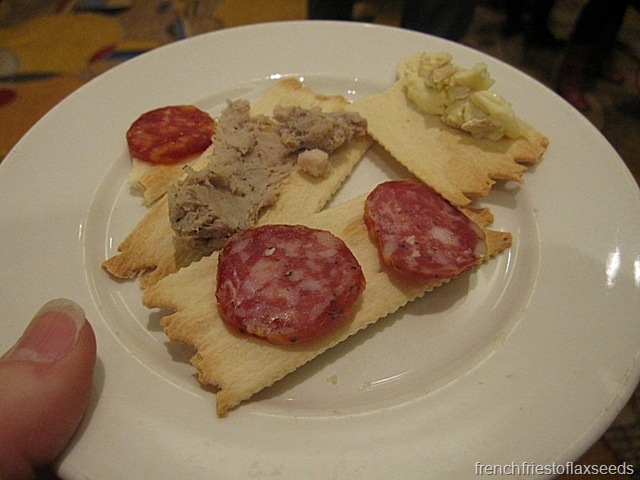 They were sampling locally made salami and chorizo, as well as some pork spread-like item (I forget the name), and more cheese! All lovely, especially the pork mixture. 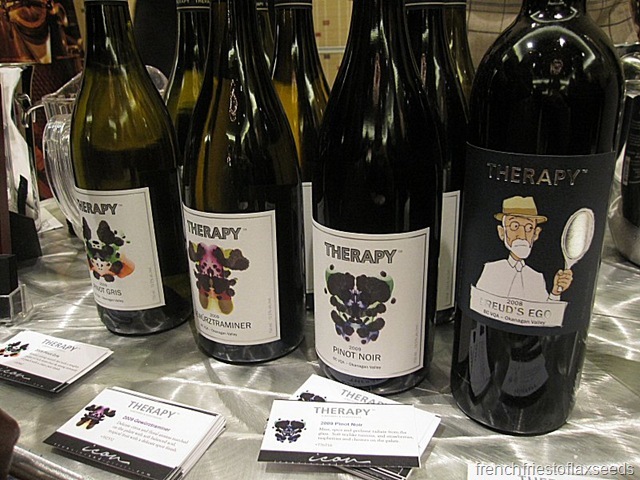 Therapy Vineyards – a winery who’s bottles I’ve always eyed up, but never purchased. I tried the 2008 Freud’s Ego, which they describe as “ripe dark berry, chocolate, vanilla, balanced with earthy notes, integrated tannins and long on the finish.” I would concur, and completely enjoyed this wine. I would pick up a bottle if I were to see it. 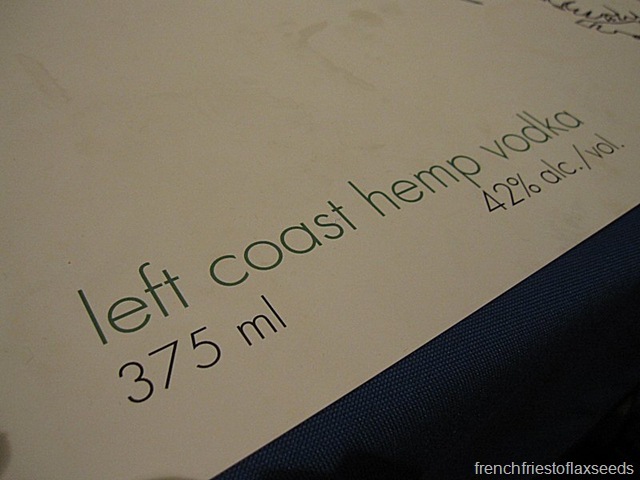 Left Coast Hemp Vodka – how could I pass on a locally made vodka, that couldn’t be any more quintessentially west coast hippie if it tried?! 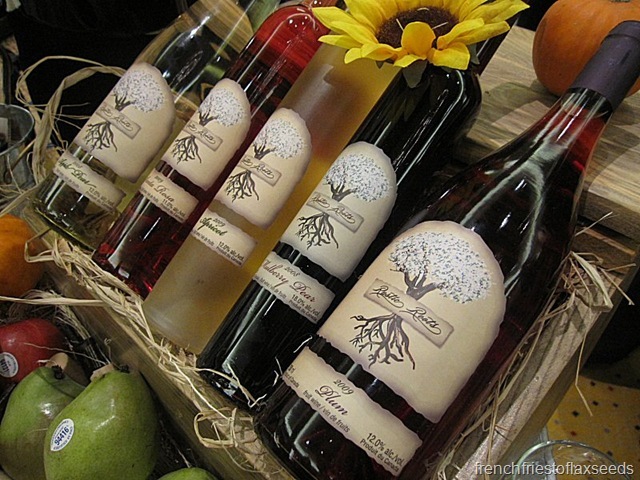 Forbidden Fruit Winery – a variety of fruit wines. 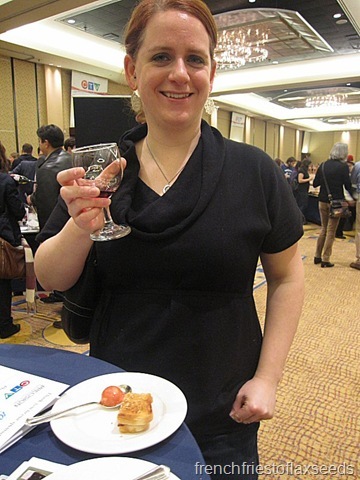 I tried the Cerise D’Eve Red Cherry Port Style 2009, which was a sweet, flavourful dessert wine. I was impressed. 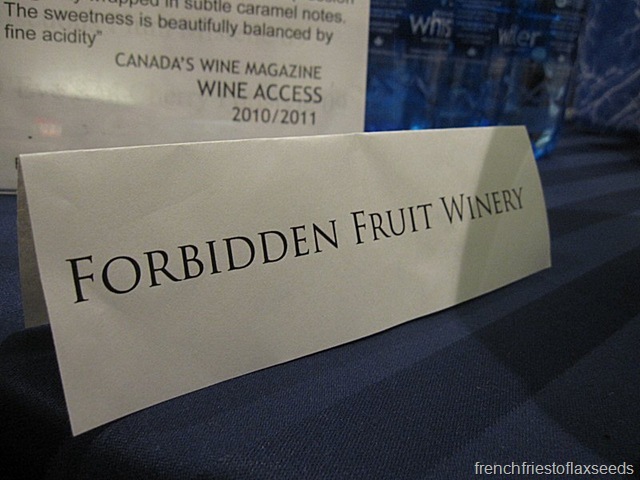 Little did I know there were better fruit wines yet to be had. Central City Brewing – they were serving up grilled cheese with stout cheddar, beer bacon, and what I call the “tomato soup orb”. 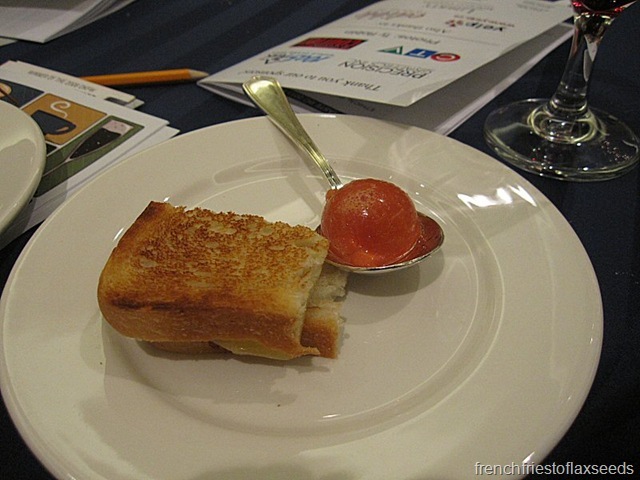 Molecular gastronomy? Sign me up! Hmmm…I don’t know how I feel about this. It wasn’t bad. But I’m not sure how I feel about soup that explodes in your mouth. Rustic Roots Winery – hands down my favourite. And they won Taster’s Choice for their 2009 Santa Rosa dessert wine. They are an all organic fruit winery with some amazing varieties, and great people presenting their wines. 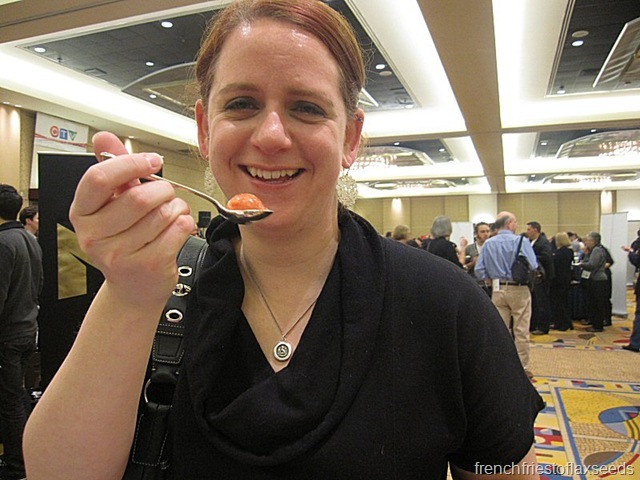 I loved the 2009 Plum Rosé – such a unique table wine with hints of grapefruit. I also tried out the Santa Rosa (great with chocolate), and the Mulberry Pear (also delicious). I will be tracking these wines down to have on hand. 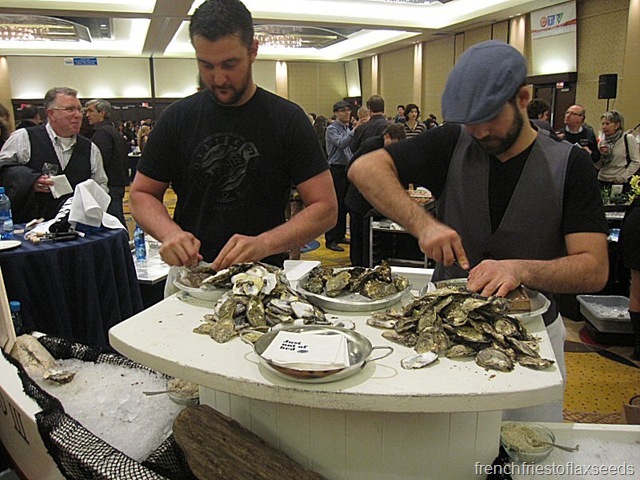 Rodney’s Oyster House had set up an oyster shucking table that attracted quite the line up. 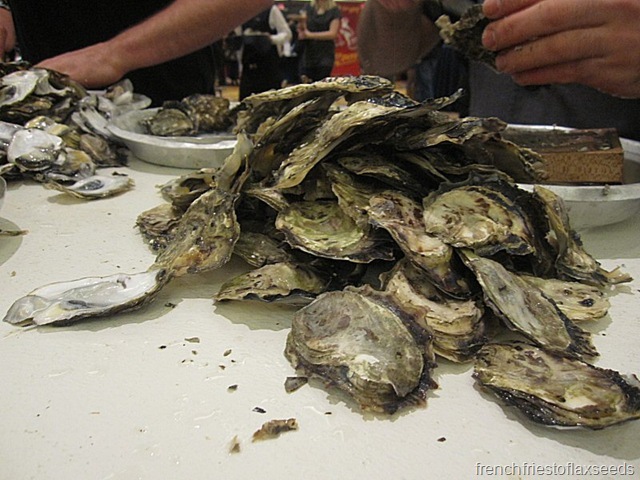 Fresh oysters on the half shell for free? Hells yeah! With plenty of toppings to choose from. We may have gone back once…or twice. 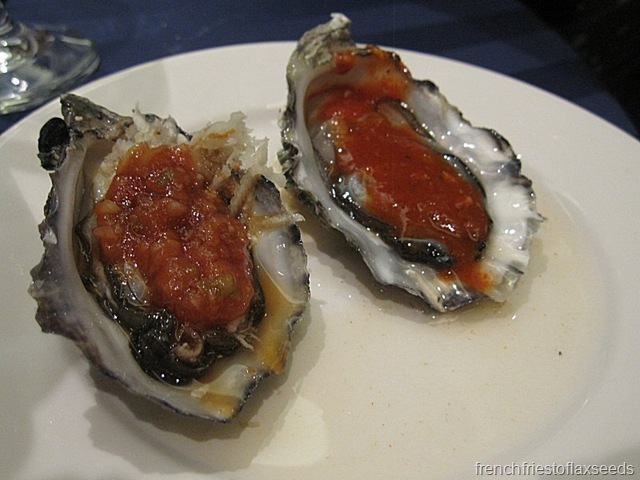 Salty, fresh, little shots of oyster goodness. 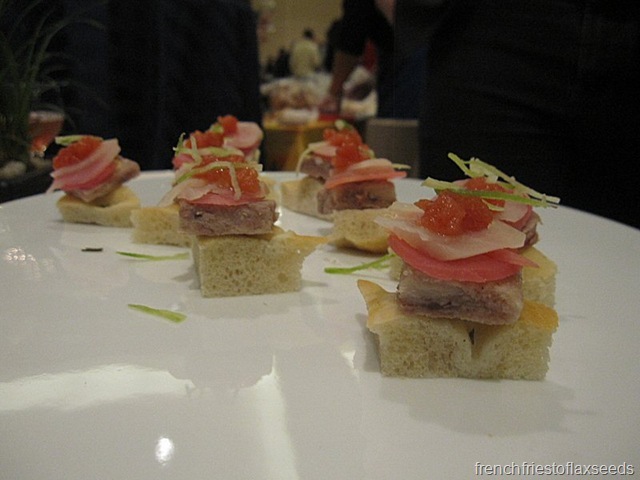 If the raw oysters haven’t creeped you out yet, perhaps this headcheese will. And yes, I tried it. And you know what? It was good! Even if I could probably never bring myself to actually purchase headcheese. 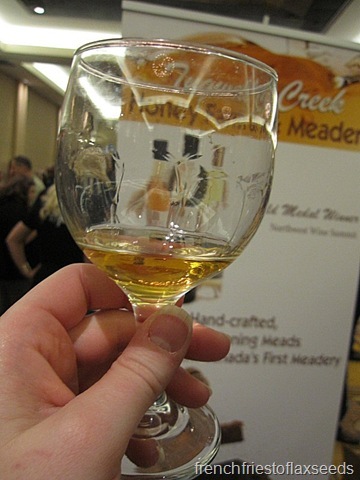 I was also able to try out some mead from Tugwell Creek Honey Farm and Meadery. It was alright, but I’d rather have wine. 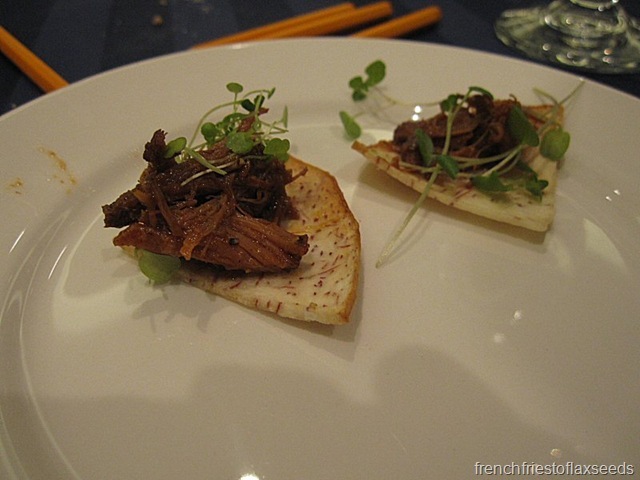 Another bite, courtesy of Central Bistro – fig and tomato braised lamb on a taro chip. Lamb and taro? Yes please. This was melt in your mouth delicious. And all on a school night! Needless to say, after all of our liquid indulgence we were in need of a little sustenance. We had hoped the Japadog stand would still be open, but it wasn’t, so we hit up the Cactus Club across the street from the hotel. We eventually decided to share a couple of appetizers. 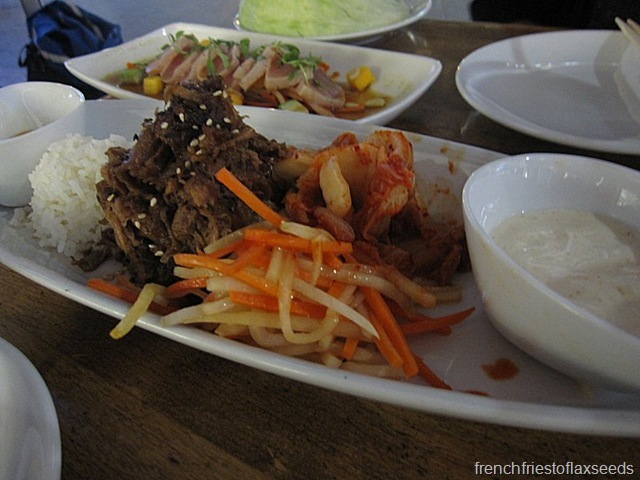 Korean style BBQ pork lettuce wraps – braised pork shoulder shredded, Asian slaw, kimchi, chopped ginger and green onion, korean chili bean sauce, spicy yogurt. 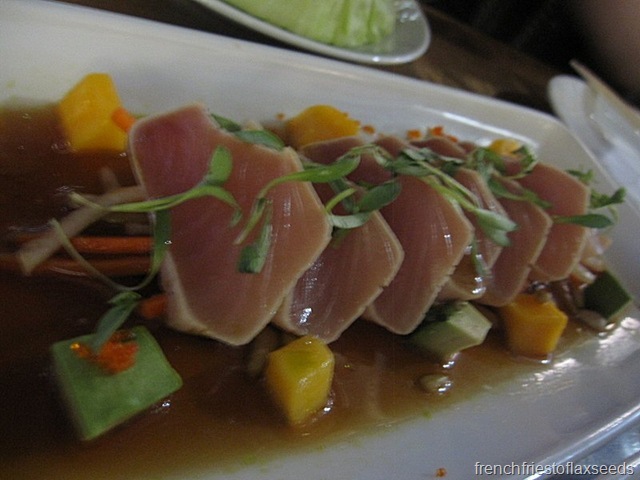 Tuna tataki – locally caught Oceanwise seared albacore tuna, green papaya slaw, orange, avocado, pine nuts, yuzu vinaigrette. 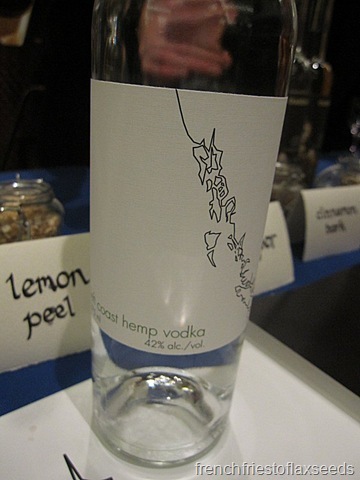 Overall, I was very impressed with the whole Taste BC 2011 event. It was a great way of tasting many of our local wineries, and such a good value for your money (tickets were $49.99, which I would consider a steal). I would definitely pay retail to attend again next year. 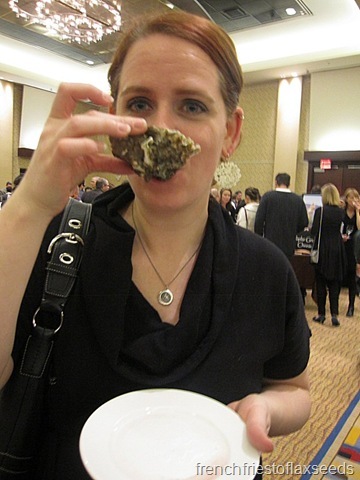 I would like to see more local restaurants showcased there, as I felt it would have been nice to have a few more eats to go along with all of the wines. Would have loved to bid on some of the silent auction items (hello, signed Canucks jerseys! ), but they were completely out of my student budget price range. I would also come a bit later in the evening to not miss out on the door prizes, and would try and take better tasting notes (as well as my good camera). Hopefully Jill and I can make plans to attend again next year! Hello delicious fode and wine! wow. that picture of me… wow. great hair, bad facial expression! i agree with your review of the event. good times. i’ve already told a few of my friends that it’s a “must do” next year… i would even pay for the ticket!